As part of an occasional Bread 101 series, I am sharing some of my favorite tools for baking bread. While you can live without them, all of these tools will make your bread baking so much easier. I have a collection of proofing baskets. They serve to help bread keep its shape during the final rise before baking. This is particularly useful with high hydration (wet) dough. They are also known as brotforms and bannetons. 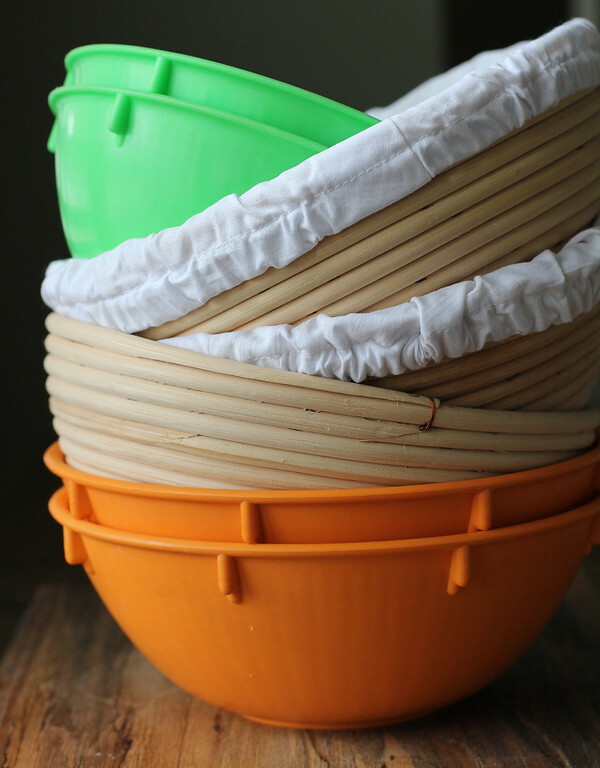 You can get the rattan baskets with or without liners. While harder to find, I really like using the plastic ones when I'm using a super wet dough. I spray them with oil, and then liberally dust them with a flour/rice flour mixture to keep the dough from sticking when turning the loaf out to bake. All of these are also great at creating a pattern on your final loaf. Most of these accommodate loaves weighing 1 1/2 pounds. The green ones on top are for one pounds loaves. You can also buy them in oval and baguette shapes. 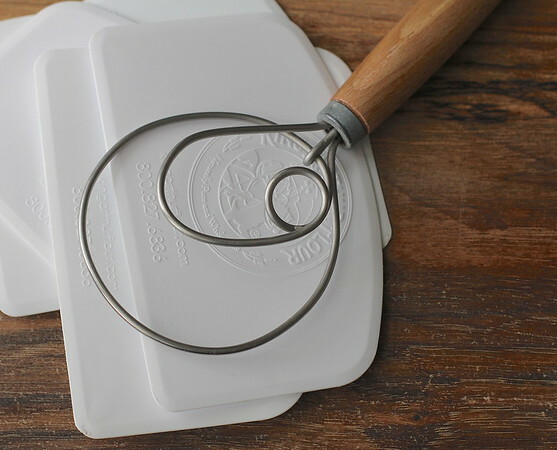 Here are two items that I use all of the time when making bread, a Danish dough whisk, and flexible bowl scrapers. I get the bowl scrapers from King Arthur Flour, and as you can see, I have quite a few. These are great for scraping down the mixing bowl, not just when baking bread, but also when making anything in your mixer. 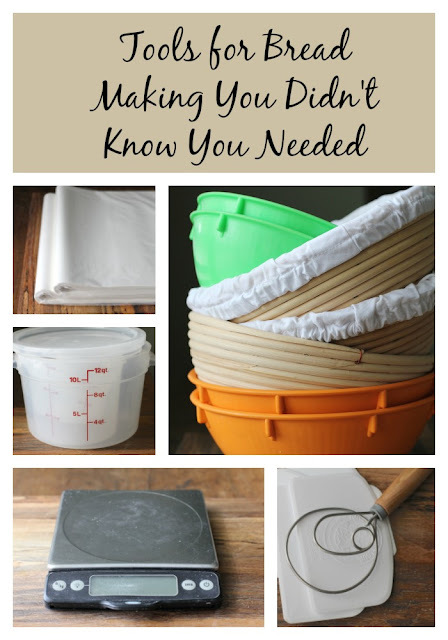 They are also great for cleaning dough residue off of your counter and out of your mixing bowl. It's so much better than getting your sponge all gunky. I also use a wet dough scraper to help with the "stretch and fold" method for kneading dough. The dough whisk is wonderful for doing the initial mix of flour and water. I initially bought it for making bread, but now use it for mixing muffin batter too. I recently got an all stainless steel one that is dishwasher safe. 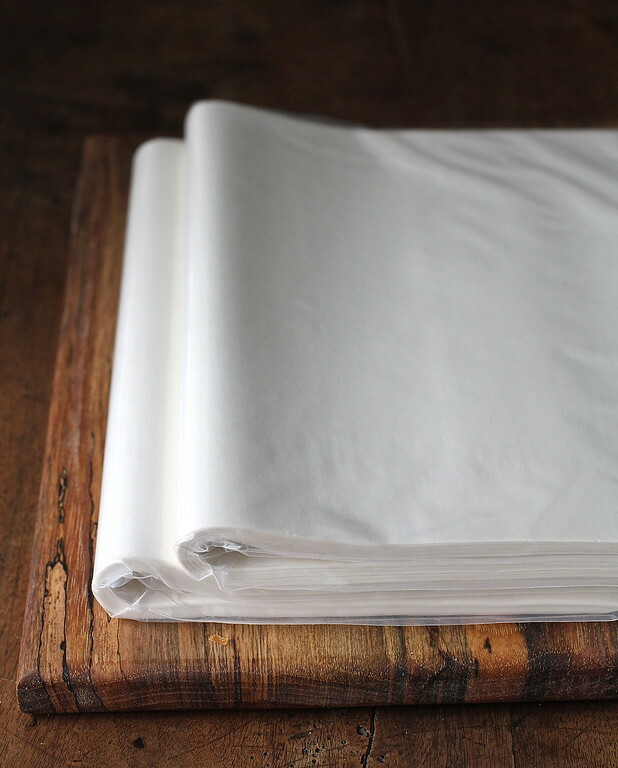 I consider these precut sheets of parchment paper absolutely essential for baking artisan bread and pizza at home. I'm terrible at working a pizza peel, and no matter how much corn meal or semolina I place under the dough, my breads and pizzas stick and lose their beautiful shape when I try to transfer them onto the hot stone. I've also accidentally thrown the dough off the back side of the stone. I use this half sheet pan sized parchment paper for sliding bread and pizza onto the baking stone. If you are worried about the crispiness of the pizza crust, you can always remove the parchment after about 5 minutes, when the crust sets. I also use the parchment to lift dough into a screaming hot Dutch oven. I leave it in the Dutch oven, and it survives just fine. It's so much easier than trying to flip the raw dough into the pan. This paper is also wonderful for simulating a baking couche for baguettes and rolls. You can crease it to separate the loaves, and then spread it out to deliver the loaves into the oven. Be sure to use thick, nonstick, quality parchment. Otherwise, you will have to scrape it off the bottom of your loaf. I learned this the hard way when I bought thin and inexpensive parchment. I swear by the precut sheets from King Arthur Flour. I buy 500 at a time when they offer free shipping. These parchment sheets hold up beautifully to very high (in my case 550 degrees F) oven temperatures. At lower temperatures (as with cookies), they are actually reusable. These Cambro polycarbonate container are also indispensable for me. I use them to mix dough, for dough rising, and to store starters. I have them in sizes from one quart to 12 quarts. Yes, I'm a bread geek. I love them because they tell me exactly when my dough has doubled or tripled. It's really hard to be sure when using a bowl. They are dishwasher safe too. Plus, the company is based here in southern California, which is becoming more rare. 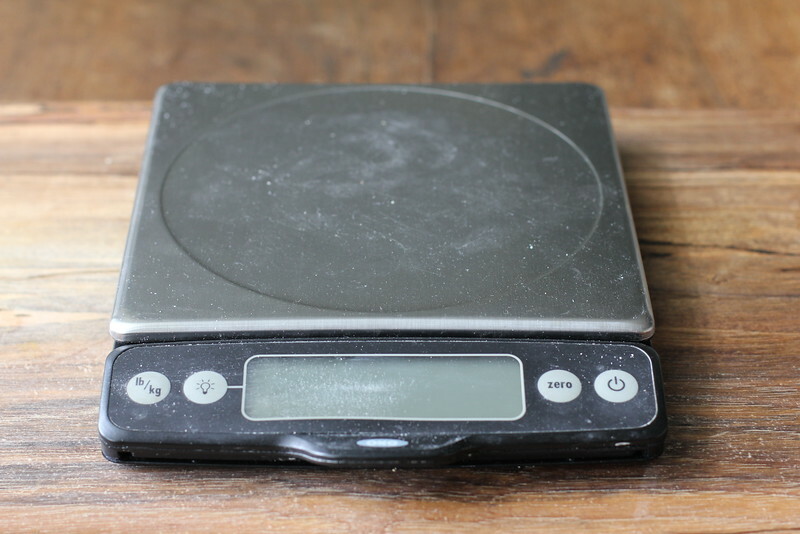 If you are going to bake, you need a kitchen scale. 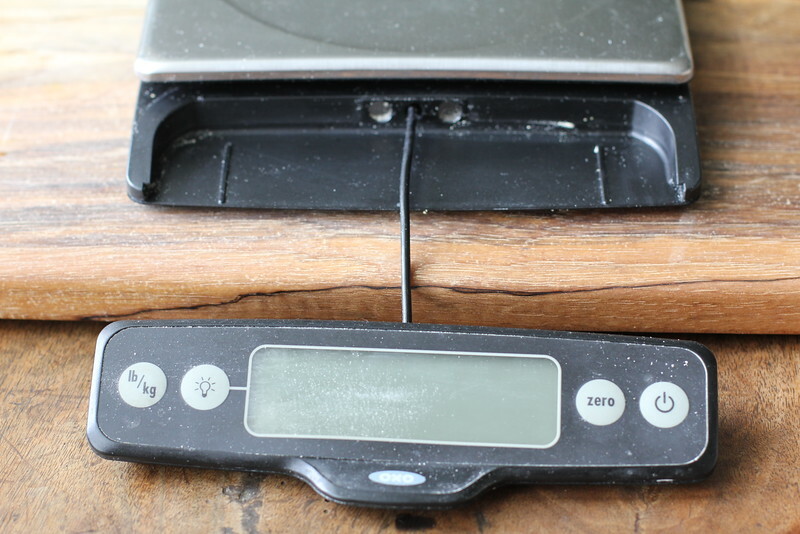 This is a photo of my well used OXO kitchen scale with a pull out display. As you can see, it is loved. This thing is probably the most used item in my kitchen. Using a kitchen scale is the only accurate way to measure flour. It also is a great way to save on dishwashing. Just place your bowl on top of the scale and add the ingredients by weight, no measuring cups needed. Did I mention it has a pull out display? 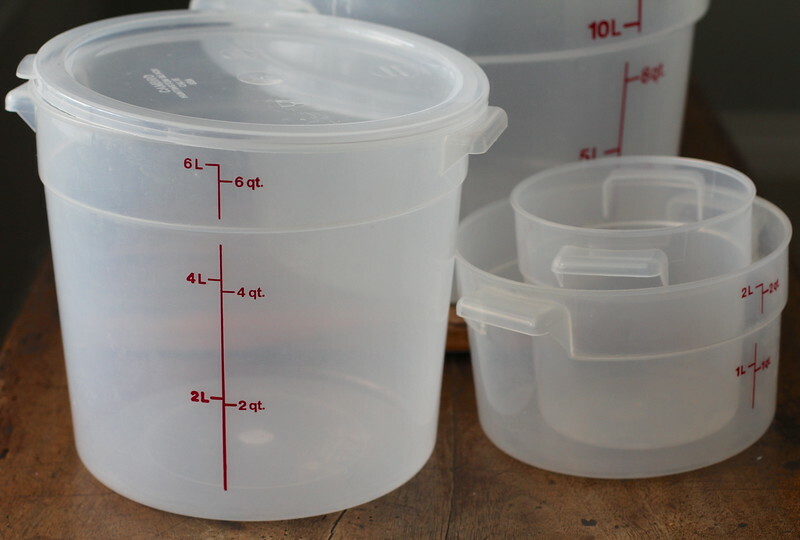 This is perfect when I am measuring ingredients into the 12 quart Cambro! A lot of my bread baking friends like this one because it figures out bakers' percentages and handles larger weights. I also like to use a digital pocket scale for measuring salt and yeast. Get a scale! You won't regret it! Finally, I do not know what I would do without my Thermapen instant read thermometer. It's pricey, but I find it indispensable. I use it to test the interior of a loaf to make sure it has reached the right temperature. Bread continues to bake when you remove it from the oven, so it's really helpful to get it to the right temperature before setting it out to cool. 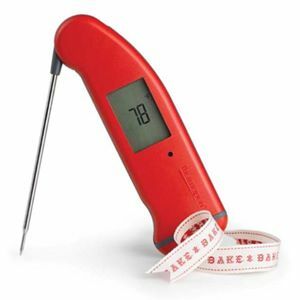 If you don't want to be greeted with a loaf of bread with a gummy middle when you slice it, you need this thermometer. I also use this thermometer for roasting and grilling meat, as well as deep frying. I also use it to test the temperature of the water or milk that I add to dough. Some bread recipes call for a certain dough temperature after kneading. I love this thermometer. Disclosure: This post contains Amazon Affiliate links. If you purchase something from Amazon via a link on this post, I may receive a very small commission in Amazon store credit at no extra charge to you. I personally own, use, and recommend the items listed in this post. I am not an affiliate of nor sponsored by any of these companies, and personally purchased their products. I knew a bread pro like you would already have everything =) I came across the plastic ones by luck. I went to a bread demo years ago at Surfas Culinary District in Culver City and they had them on that day. I've never seen there since! You are so sweet my friend! I agree that round breads aren't the best for every day. The batard is great for that. The scale is AWESOME! Someone needs to buy you a gift!